The inclusion in a specific year's listing does not mean that is the year of founding or the only year(s) of existence for that business. There were probably no grocery stores in the Norwoods at this time. However, that needs to be researched more—a mention was made in an April 1888, newspaper column that the telephone station was moved to Dressel's drug store in South Norwood from Hock's grocery; whether Hock was in Norwood needs to be determined. Also, the following month, a question by a newspaper subscriber "Are there good groceries out there?" was answer "Lots of them." Did this mean there were actual grocery stores or just abundant delivery services? By at least December, 1887, J. H. Starr ran express wagons through Ivanhoe (southwest Norwood) and the Norwoods (East, West, South and old Norwood) on Mondays, Wednesdays and Fridays from Z. B. Coffin & Co.'s at 117 West Fifth Street, Cincinnati. Orders could be left at Coffin's Grocery or Allen's Drug Store, corner of Fifth and Main, Cincinnati. In the 1894 book Norwood, Her homes and Her People," it was written that besides the special delivery wagons from Cincinnati, the village had "half a dozen groceries, several butchers, daily markets, three drug stores, tailor shops, bakeries, dry goods stores and candy shops." There were also "daily deliveries of ice." In just two years, the number of food stores appears to have more than doubled. There were 17 groceries and daily markets, and 7 meat stores (4 of which were associated with grocery stores) in Norwood in 1896. The following are some of the groceries and meat markets in Norwood in 1902. J. J. Casey - s.e.c. Ivanhoe & Delaware ave.
J. F. Diekmann - 3739 Main av. Norwood Meat and Poultry Co. - 4623 Main av. ; Thos. Burkart, owner?, res. 2056 Lawrence av. An advertisement for India & Ceylon Tea, in The Cincinnati Post, listed stores carrying the product. Those in Norwood were H. C. Florea, 3738 Main ave.; Reverman & Co., Main and Sherman (see 1916); J. Schillmoeller, Carter and Lincoln; and H. Sindlinger, 4100 Main. In 1912, there were 37 grocery store and 19 daily market locations in Norwood. At that time, before supermarkets, it was the standard for each neighborhood to have its own market or two. Although most of the stores were independent, a few had two or more locations. That year, the Kroger Grocery & Baking Company had three locations: northeast corner of Carter & Mills Avenues, 4108 Montgomery Pike and 4629 Montgomery Pike. An advertisement for Edward "Made in Cincinnati" Pressed Steel Ceilings showed a photo of the inside of Mr. M. J. Hilberg's grocery at Smith Road and Marsh Avenues. It stated that Mr. Hilberg was one of Norwood's most successful business men and the proprietor of several stores (probably all in Norwood). Another type of food venue was the Norwood Market House. According to the Williams' 1913-14 Norwood Directory, Joseph B. Levingood was the marketmaster of this building at the northeast corner of Mills and Walter Avenues. Later, this building was used as an roller rink, private ice hockey club, piblic ice skating rink, then an automobile safey lane, state license bureau, amateur boxing center, and currently a city storage building. 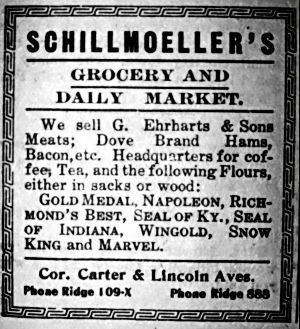 Schillmoeller's Grocery and Daily Market — cor. Carter & Lincoln Aves. There were a total of 63 groceries and daily markets in 1919. From 1912 to 1919, the number of Kroger stores increased from 3 to 11! There were 89 stores with 4 Burke's, 5 A&P's, 28 Krogers', 7 Schneider's and 4 Voss'. Twenty-one of those grocery stores were on Montgomery Road, and eight of those were Krogers'. This was a 59% increase compared with the number of groceries and daily markets in 1912, just 18 years earlier, and a 41% increase from 1919, just 11 years previous — strong indicators of Norwood's population growth in that time period. There were 17 meat retailers in 1930. Some were associated with a grocery, e.g. Gallenstein and Voss. A couple of years later the number of groceries was 84 stores — a loss of 5. The major stores were Burke's with 4, A&P with 5, Krogers' with 23 (a drop of 5), Schneider's with 8 (a gain of 1) and Voss' with 4. Eighteen of those grocery stores were on Montgomery Road, and five of those were Krogers' — the reduction of 3 stores was entirely the loss of Krogers'. This was over a 5½% decrease compared with the number of groceries and daily markets in 1930. The same 17 meat retailers were in Norwood in 1932, as were in 1930. Some were still associated with a grocery, e.g. Gallenstein, Kuhn and Voss. Lawrence G. Deters - 3841 S. Madison Av. A & P (Great Atlantic & Pacific Tea Co.) ? Albers Supermarket - 4500 Montgomery? Mrs. Irma Deters - 3841 S. Madison Av. 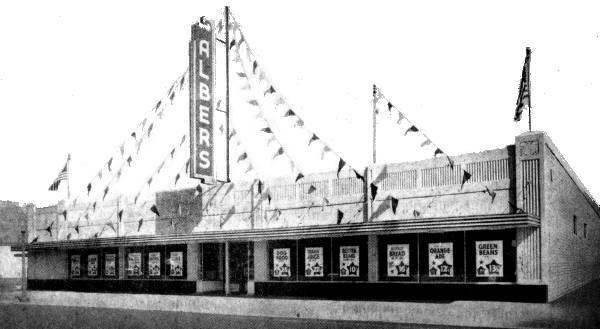 The first Albers Supermarket was opened by William H. Albers, a former president of the Kroger Grocery & Baking Company, at 4500 Montgomery Road (at Madison Avenue) in November 1933. It claimed to be the first grocery store to use the name "supermarket" and later received a plaque from the Ohio Historical and Philosophical Society designating the store as "Ohio's First Supermarket." Eventually, the Albers chain that developed from this first store was acquired by Continental Store. The original store was remodeled in 1961 and was destroyed by a fire on April 21, 1968. Although the company planned to rebuild the store, it never did. The land was acquired by Norwood for Part II of the urban renewal that created Surrey Square. The creation of supermarket stores probably was the end for many of the neighborhood groceries. Kroger's, for one, would not need the expense of the 23 stores it had in Norwood at that time, and, as seen below, the number of those stores steadily decreased over the years, until now there is only one Kroger store in Norwood. In 1930, Kroger had 28 stores in Norwood (its peak number). In 1933, there were 23 stores, by 1942 and 1944, that number was down to 6 and by 1954 there were only 4. From around 1942 to 1944, Kroger had only one store on Montgomery Road—at 5234, just north of Indian Mound Avenue. Sometime between 1944 and 1949, Kroger had taken over the two Pay-N-Takit grocery stores at 4416 (near Madison Avenue) and 4635 (at The Sharpsburg building, next to the main fire station) Montgomery Road. It still had the other Montgomery Road store, near Indian Mound Avenue, also. 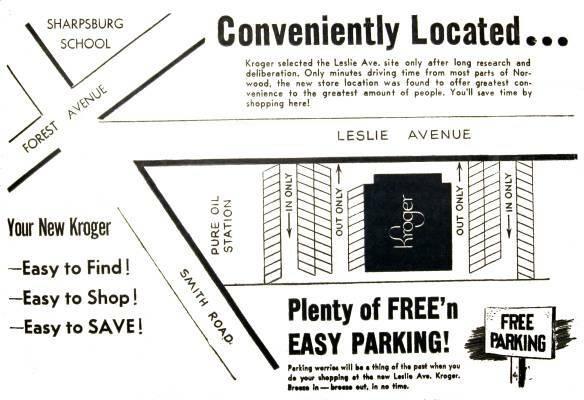 Kroger closed The Sharpsburg store at 4635 Montgomery Road on Saturday night, June 14, 1952, and opened a new larger store with free off-street parking at 2515 Leslie Avenue on Wednesday, June 18, 1952. On the first of October, The King Drug Company moved from 4629 Montgomery Road (which at one time had been a Kroger store) to the vacated Kroger store at 4635 Montgomery Road. By 1954, Kroger had only two stores on Montgomery — 4416 and 5234. In 1959, Kroger closed both of the remaining Montgomery Road groceries. The 4416 Montgomery store, near Madison Avenue, was replaced with a Sperry & Hutchinson (S&H stamps) business. A phenomena of today is the "quickmart." Often associated with a gas station, it is a small grocery store, where convenience food items can be purchased. Some of these in Norwood were the Auto Circle Food Market at 3828 Montgomery Road and the Ameristop Food Mart on 4522 Allison Avenue. The UDF (United Dairy Farmer) stores can be included in this category. Some more Norwood grocery stores not yet listed above.